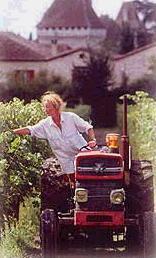 Patricia and her husband had no plans to be winemakers. They juggled the restoration work with financial consultancy, intending one day to employ a local winemaker to look after their little vineyard plot. But a serious run of bad luck culminated in a stock-market crash, and meant their idyllic life became just as stressful as the ones they’d left behind. Patricia’s dream turned into a nightmare when her husband, unable to see a way out of their position, decided to return to Britain. Patricia was left with practically nothing; certainly not a word of French. The story that follows is a remarkable tale of triumph in adversity. Her small patch of vines became the only hope of escaping a desperate situation. But with no money to employ anyone to tend the vines, she set about learning the skills of viticulturist, winemaker and estate boss from scratch.Patricia’s estate is the Clos d’Yvigne. Over the next decade the original, tiny, four hectare plot of vines gradually evolved into a sizeable estate of 21 hectares. In that time, Patricia has begun to carve out a reputation as a gifted winemaker. Patricia has written the story of her extraordinary life as a winemaker (so far) in a brand new book, The Ripening Sun. The Ripening Sun by Patricia Atkinson is available from March 20, 2003. It is published by Century Press at £12.99. You can buy it at Amazon using this link. These wines are in very limited supply, and are in a small number of Waitrose stores. I loved this wine it is fair to say. Regular visitors will know I have a penchant for white Bordeaux, and this wine has all the taut, lithe, elegant qualities of a young white Graves. Often New World oaked Sauvignon Blanc is too flashily wooded, with a big, obvious layer of oak failing to marry with piercing fruit, and presenting a disjointed picture. Here, like in the best white Bordeaux, the oak is supportive and integrated, and the whole picture much more intriguing and satisfying. Perhaps the Sémillon content helps, adding a waxy richness and melding the components together. The nose has deep, luxurious notes of toast, vanilla and downy peach skins, with a little creaminess, and a zesty note of lemon. In the mouth this is powerful and structured, with fine citrussy acidity and greengage flavours giving cut to full, buttery fruit and creamy oak in the broad mid-palate. This need some time, and should be even better in five to ten years. Very good indeed/excellent. £9.95. The colour is deep and intense, and the nose is immediately harmonious and very classy, with savoury, dark, plum and damson skin aromas, some cedar and a very sumptuous depth hinting at sandalwood and violet. On the palate it is medium-bodied and dry, with sweet and sour savoury black fruit and some tobacco filling out the mid-palate, with a weight of fine-grained, ripe tannins gripping the finish. Acidity is gentle but nicely balanced to extend and freshen the finish, and this has a long, svelte, very composed character. Very impressive and very good indeed. £8.95.